Longwood Cottage01989 740248work01989 740214fax Self-cateringIf you enjoy wandering through meadows and orchards, staying in a wonderfully comfortable cottage with great views, eating out at reasonable prices, then Longwood Cottage is the holiday home for you ! Originally converted from a small barn, Longwood Cottage enjoys a delightful country setting within an area of outstanding natural beauty and with spectacular views in all directions. Entry to the cottage is via a sloping ramp from the large enclosed garden with its parking area. The sitting room has French windows which open out on to the sun deck – this traditionally furnished room has a Parker Knoll three piece suite plus a comfortable “squashy” sofa. There is a dining table with four chairs as well as a selection of occasional tables, a Sony TV, DVD player and small sound system. In addition to the well fitted modern kitchen there is a spacious bathroom with an electric shower over the bath, and a separate cloakroom with washbasin and a toilet. There are two bedrooms, one with a double bed and the other with two twin bed; each of these rooms has a wardrobe, easy chair and ample storage facilities as well as windows either end of the room. The cottage is carpeted throughout, has central heating as well as a log-effect electric fire, and is double glazed for cooler times of the year. 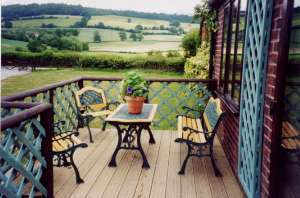 All rooms enjoy beautiful views of the surrounding countryside. Our cottage accommodation is all situated on the ground floor and although not fully accessible, it is suitable for those who have some mobility with assistance. We welcome children over the age of 4 and of course well behaved dogs. From the cottage it is just a few steps into the orchard, meadow and Long Wood itself, and you may be lucky enough to see our family of fallow deer whilst walking along one of the private paths. In the spring Long Wood is awash with wild flowers such as primroses, cowslips and early purple orchids. Sollers Hope is a small hamlet in south east Herefordshire. Surrounded by woods, orchards, farmland and rolling green hills, it is bordered by Marcle Ridge from where there are superb views towards the Malvern Hills and the Cotswolds to the east, and the Welsh Borders to the west. There are countless lovely walks to be taken without a car and many local villages have pubs known for the quality of their home-cooked food, ales and cider. The towns of Hereford, Ross on Wye and Ledbury are all approximately eight miles from the cottage, the Wye Valley Walk and the Forest of Dean are also only a short distance away. There is a small supermarket, newsagents and butchers shop in the nearby village of Fownhope – just five minutes’ by car. Longwood Cottage offers free wi-fi to guests. Well behaved quiet dogs are welcome by prior arrangement. We offer a discounted rate when only two people occupy the cottage. Sollers Hope is less than fifteen minutes drive from the end of the M.50 motorway. Guests will be given a route planner on confirmation of their booking as satnav is not totally reliable in this area. The nearest petrol station is at the end of the M.50 at Ross on Way and this is also the best area to shop before arrival as it has Morrisons. Aldi and Sainsburys supermarkets.